« Day 274 – Chad C.
I keep all my notes from the people I meet in a small Moleskine notebook. I had filled up my third notebook and today I cracked open my fourth one. By the way, Moleskine was very cool and sent me six notebooks when they heard about my project! I use the small pocket-size ones and they sent me the exact size I use in a variety of styles. Some have hard covers, others have soft covers. I think I prefer the hard cover ones – they seem to hold up a little better as I schlep them around with me every day in the elements. Anyways, thank you Moleskine! You guys rock! I used to live in Mexico when I was in high school and for a short while in college. I have a very special place for the people of Mexico, especially those from my “home town” of Guasave, Sinaloa. 2010 is the year of the Bicentennial Celebrations in Mexico. This wonderful country is commemorating 200 years of independence from Spanish rule and 100 years of its revolution that began in 1910 and toppled dictator Porfirio Diaz. Mexican Independence Day is September 16th but is often celebrated on the evening of the 15th. Here in Washington there was a huge celebration put on in the outdoor courtyard at the Kennedy Center that was free to the public. As I listened to live music and watched the jubilation unfold, I noticed a large Mexican flag in the center of the courtyard. I decided to give my $10 to whoever was holding that flag! 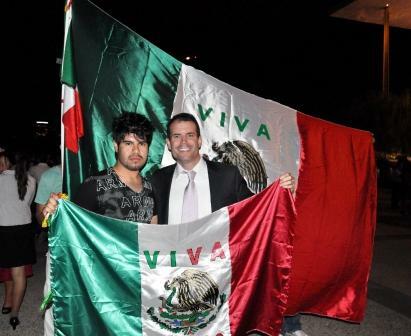 Diego, whose real name is Dagoberto but nobody calls him that, stood in the center of the crowd holding the red, white and green flag. Originally from the state of Chihuahua which is located in northern Mexico, the 21-year-old has lived in Maryland for two years now. His father runs a security company that provides services to a branch of the federal government. Diego, who is the middle of three kids in the family, works there with his dad and also takes English classes. Although he likes being able to work with his father he hopes to get his degree and establish his own career. “I want to succeed,” he says with pride. “Well, I have been thinking about that. At first I thought I would just buy me and my friends some beer tonight, maybe some Modelo Especial, but I think I have changed my mind,” he said pausing and looking far off into the crowd. He looked back at me and said, “I would like to give the money to you. You are doing lots of good with your project and I would like you to have my $10.” I explained that I would be happier if he did something else with it, but it’s not about me, it’s about what he wants to do with it. He said he was sure about his decision and placed the $10 back in my hand. I thanked him for the $10. We took this photo together and exchanged some final words in Spanish before saying goodbye and wishing each other the best of luck. Gotta’ love those fireworks! Interesting choice that Diego would hand the money back to you. Did you tell us what you did with the money and I missed it?